Browse 75 jobs related to this course. To play any game well, you have to have a clear grasp of what the game is about, what the objective of the game is, what counts as winning, and also plenty of practice. But it is also helpful to listen to advice, for there are quite a few useful principles and precepts. They will not be useful, however, unless taken in the spirit they are given. For instance, it is a useful bit of advice in tennis to say “Keep your arm fully extended and do not bend your elbow too much”. But there are plenty of occasions, when you are up at the net, for example, when this advice should be disregarded, and it is impossible, for the coach to make a complete list of these exceptions, because so much depends on the individual player, on his opponent, on the conditions of the court and so on. The person being coached must certainly not disregard this advice, but neither must he take it too seriously, or think that if he always follows this advice he will necessarily play good tennis. He must learn to take the advice in conjunction with practice in playing the game itself, and consistently move back and forth from the advice to the actual situations he meets on the court. Only by doing so, will the player get the most out of the practice or advice. An extract from: Reader for PHL 100 B, Approaching Philosophical Issues, UNISA. For successful development and performance to take place, coaches firstly, need to be subject matter experts that is they must have expert knowledge of the game of football. “The game is the teacher” and coaches, coach or train what the game demands. 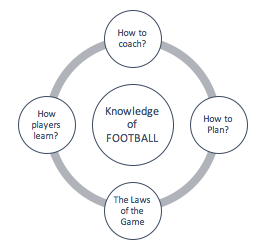 To be an effective coach, linked to this knowledge of the game is the knowledge of how to coach, how players learn, how to plan as well as the laws of the game. The immediate treatment of injuries and basic first aid are necessary life skills needed by the coach. Those coaching football, or those planning to coach football, at any level / age group. Steve Coetsee is a SAFA Professional Licensed coach, a SASCOC Master Coach & a CAF Elite Instructor. In 2017 Steve entered his 41st season as a Coach which has seen him coach at every level of the game in South Africa. In the early 80’s Steve served as Coach to current continental champions Mamelodi Sundowns. He played professionally both in South Africa and in Hong Kong and made the transition into Coaching early on. Currently, Steve serves as a CAF Elite Instructor and travels across the continent to deliver Coach Education programmes to coaches at the highest level. This course serves as an introduction to football coaching. The basic principles and ideas of “What is football?” and “What is Coaching?” serve to stimulate a new approach to Youth Development, where creating an environment of learning is essential.